I’m sort of perplexed by J.J. Abrams’ Star Trek films. They strive for nothing except homage, to the point that one cannot really even consider them reboots. He casts young actors in iconic roles and asks them to do little more than to embody culturally familiar archetypes. All well and good: what we get then are films of extraordinary visual flare (no pun) and fleet pacing (again) that recreate the dynamics of the original series. 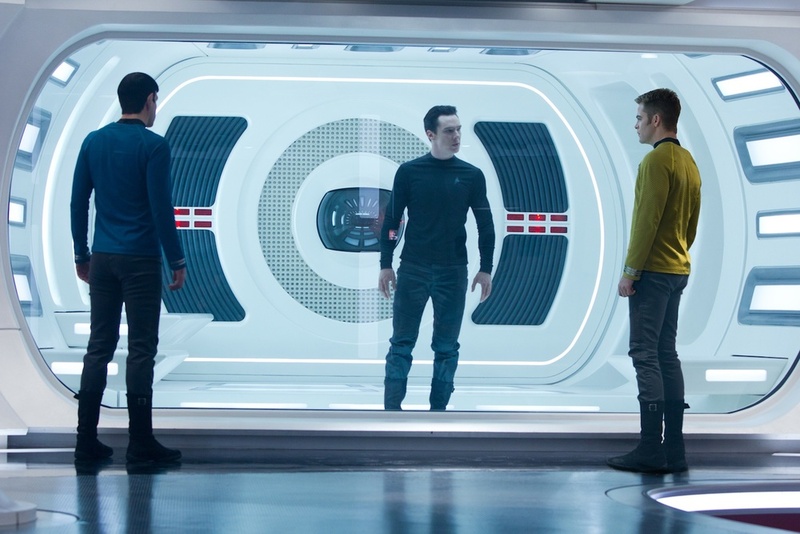 So the aesthetic of Star Trek Into Darkness pleases someone like me. I have no particular love for the original text, though I hear tell it is glorious in its camp, its innovation and its progressive vision of society. I’m game for low-hanging fruit Khan references and well-choreographed action. There’s a gravity-shift gauntlet run that probably rivals Inception’s and opening chase through a visually stunning ruby-red forest. Thank god, there’s nothing even approaching a Bourne-derivative shaky-cam punch-fight. So, Into Darkness is not as curious or esoteric as its source material, but it really isn’t meant to appeal to the original Trek base. The idea is to cast as wide a net as possible. But that doesn’t mean it’s an unproblematic romp. There’s the unfortunate, 9/11-y ending to the film. Abrams has always had an itch towards visually quoting the September 11th attacks. I’m not one to say these allusions are off-limits, but they are far less potent than they were in, say, the 2005 War of the Worlds. Equally dull is the old bad-guy-is-intentionally-captured-in-order-to-ensnare-the-protagonist trope. It was terrifying in Silence of the Lambs, compelling in The Dark Knight, and redundant in The Avengers and Skyfall. By now, it’s just lazy. And whereas the Leonard Nimoy cameo in the first Abrams Star Trek was a hoot, this film’s future-Spock appearance is just silly. But what about the lit-nerd draw? I am a fan of Benedict Cumberbatch, and casting him as the ambiguous-ish villain of Into Darkness is both inspired and misguided. On the one hand, he can gnaw scenery and any actors that happen to be there (e.g. a magnificently unfair sequence where Cumberbatch seems to be channeling Richard Burton while Chris Pine decides to unleash his Shatner homage). This is a safe bet: every action director should snag an RSC alum for his villain. Call it the Hans Gruber Rule. On the other hand, the character is not very well conceived. I doubt anyone who has seen this film to can explain why Cumberbatch’s decides to take revenge writ large on Earth, or for that matter can explain his objective. Moreover, the baddie’s poorly-defined capabilities amount to superhuman intelligence and strength. Cumberbatch’s intelligence is a given (see: BBC’s Sherlock), but no matter how much muscle the actor puts on he still seems best suited to play a particularly malnourished Konstantin in The Seagull. This villain is just the most glaring example of Star Trek Into Darkness’s head-scratching narrative. I don’t think I’m being a killjoy here. I’m not asking you to explain how warp-speed works or discuss how a cold-fusion device is supposed freeze a volcano. I simply want something akin to coherent storytelling. There are a thousand nits to pick with Into Darkness, like why Starfleet would trust a 300-year-old being they just unfroze with a new-weapons development program. Or why a terroristic character would blackmail someone into infiltrating up a secure government building that he, the terrorist, already had access to. Or what about those missiles with the secret payloads? What was anybody’s plan concerning those? With all these faults in mind, Pine and Zachary Quinto, Simon Pegg and Karl Urban, the virtually unused Zoe Saldana – really the whole core cast is as serviceable here as they were in Abrams’ first Trek. And their relationships have not really changed since the last film. There’s a court-martial and the death of a tertiary character early on. Mostly, it’s just starships facing off and running about and Cumberbatch scowling before a smoldering urban ruin that’s more than a little reminiscent of Ground Zero. This series is going to continue, with or without Abrams at the helm, but something tells me it might have reached its high-water mark four years back.